Working with a school overseas does more than help to create global citizens. Growing evidence shows that it can contribute to pupils’ academic motivation and attainment, say James Love and Claire Kennedy. Partnerships with schools in the global south have grown hugely in the last few years with some 5,000 UK schools estimated to be participating. The quality of these links is increasing, too, thanks to support and training from a wide range of organisations plus new technology that is helping to bridge the communication gap. Gone are the days of school partnerships consisting only of a dusty noticeboard with a few photos and a fundraising event once a year. Now, the focus is on global learning through exciting shared curricular projects with students exchanging information and investigating common issues such as fair trade and climate change. But, in this era of increased scrutiny and pressure on schools to raise performance, do such partnerships really have an impact? A growing body of research suggests that they can not only support global learning but increase pupil motivation and performance and support teachers’ professional development, too. It is not just students who gain from a partnership; teachers benefit, too. The chance to see teaching in very different circumstances can encourage new ideas and different approaches. Spending time immersed in a different culture helps to bring different perspectives into the classroom and not only for northern schools. Partnerships can support schools in the south to improve education in a far more sustainable way than fundraising. Surveys of teachers in the Partner Ghana schoollinking programme in 2012 found that teachers consistently rated the impact on their professional development as a key outcome of partnering. Kimbolton School, an independent school in Cambridgeshire, and Essaman United School, a secondary in Elmina, Ghana, have been working for more than a year with Partner Ghana to develop their partnership. Their focus is on projects around topics that already feature in both curricula, such as fair trade and rainforests, to give students a broad learning experience. Teachers have delivered lessons on topics including fair trade (geography and religious studies), slavery (history), and the intricacies of the popular Ghanaian game Oware (maths). A Year 9 student trip to Essaman United, planned for Easter 2013, will develop the projects further. Pupils will take part in a field trip to a local cocoa farm to gather information first-hand about the process of growing cocoa, as well as investigating the lives and livelihoods of local workers. There will be shared lessons, where students will present information from their different contexts, and pupils will also visit nearby Elmina Castle, a former slave castle. Claire Kennedy, a link teacher at Kimbolton, believes that the partnership has had a marked effect on her pupils’ understanding of distant places and peoples. “Few learning experiences can match the impact of direct interaction with those from another culture or the impact of visits to – and ongoing communication with – places previously seen only in geography textbooks or on news bulletins,” Claire says. Essaman teachers have benefited greatly, too. A recent visit to the UK enabled teachers Kwame Essuman and Jude Arthur to examine teaching in a different context. As a result, they are now working on implementing more pupil-centred methodologies and are exploring alternatives to corporal punishment in their own school. James Love is the UK Partner Ghana coordinator and has four years’ experience managing school linking programmes. Tracing Cadbury’s cocoa Partnerships with a school in a developing country can be an ideal way to embed global citizenship across the curriculum. 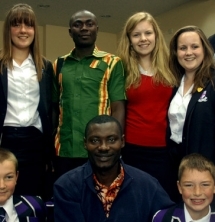 Links with countries such as Ghana can provide a real-life context for pupils to learn about the realities of slavery and colonialism and explore contemporary issues. Tracing Cadbury’s cocoa back to its roots and investigating how fair the prices paid to farmers really are or exploring the effects of deforestation on Kakum rainforest can inspire pupils to think more critically about their world and embrace social justice. The evidence speaks for itself. A 2011 survey by the National Foundation for Educational Research (NFER) of more than 8,000 UK pupils assessing the impact of global partnerships found that participation had a significant positive effect on the awareness, attitudes and responses of pupils to global issues. Crucially, the study also concluded that school educational partnerships are considered to be more effective global learning interventions than many other educational initiatives.